Putting “Mohammad bin Salman” next to “Arab Spring” is either an oxymoron or an antithesis. A demonstration to protest against US President Donald Trump's decision to recognize Jerusalem as Israel's capital, in Gaza City, Saturday, Dec. 9, 2017. Picture by Majdi Fathi/NurPhoto/Sipa USA/PA Images. All rights reserved. Whatever was left of “star-columnist-and-best-selling-author” Tom Friedman’s credibility as a serious reporter was most likely lost in his November 23 NY Times’ infamous op-ed, where he described crown prince Mohammad bin Salman (MBS) as the Middle East’s “most significant” liberal reformer, and the true reincarnation of the ‘Arab Spring’ after a long ‘Arab winter’. “At last”, as the title says, a new Middle Eastern savior has been born, and Friedman ambitions to be his messenger. Despite his three Pulitzer Prizes (for his already distant work of the 1980s and 1990s), Friedman is probably the most overrated international reporter in the western world. His best-selling books are essentially lame platitudes and easy popularizations of trends that have been at work for decades (globalization, etc.) and were far better explained by countless, more substantial intellectuals and analysts before him. They often seem to be far more about Mr. Friedman himself, and usually read as much as exercises in narcissistic self-aggrandizement as the enlightening explanations of the world destined to educate us, the masses, that he wants them to be. Besides his self-complacency, analytical sloppiness, intellectual laziness, frequently glaring ignorance or misunderstanding of the topics he writes about , crude “Washington Consensus” ideological conformism, cheap and easy optimism, and repetitive, formulaic, predictable stance on trends he aspires to reveal to us though he often seems to be behind the times and the last one to discover, in childish awe, things everyone had been writing about for years if not decades, Friedman sounds like an egotistic, pompous megalomaniac. Is Friedman really the best the NY Times can find? Serious thinkers, intellectuals, analysts, and scholars stopped paying attention to this media figure a long time ago (if they ever did), and for a while, he has been a subject of mockery. Some would say he is just a joke. Even for the NY Times itself and its journalists, he has become an embarrassment, to the point one truly wonders why this character is still on the payroll of such a prestigious and serious newspaper. Is Friedman really the best the NY Times can find? Yet, he definitely grabbed our attention (the negative type) with that column, which has provoked outrage, disgust and dismay at the fact the NY Times was publishing this truly awful and shocking piece of shameless propaganda for Saudi Arabia’s new despot. Daniel Larison described Friedman’s full-page piece as a “love letter to a war criminal”, which was echoed by Daniel Martin Varisco calling it “an undisguised love-song for a brutal and calculating potentate”, while Mehdi Hasan righteously ripped him apart on Democracy Now. All of which will without a doubt be seen by our globe trotter as further evidence he “nailed it”, that he has once again created a “buzz”, and that he is indeed “important”. Friedman’s arrogance will most likely prevent him from considering the fact that everyone immediately saw the exact same problems with his “reporting”, as any real journalist would do in such a case. Besides, he has already answered his critics with a sophistication that matches his writing and analytical skills. It is not the first time, far from it, that Friedman writes repellent pieces. But this one reaches a new level in abjection. Its complete lack of journalistic ethics and its shamelessly propagandistic nature is immediately obvious to anyone reading it. But it is the tragic context of the post-Arab Spring Middle East that makes Friedman’s op-ed particularly repugnant on all levels—journalistic, professional, ethical, or simply human. Is MBS the rebirth of the Arab Spring? Arguing as Friedman does that MBS is presiding over some kind of rebirth or continuation of the Arab Spring is probably the most absurd and counterfactual claim of the year, one that already reveals Friedman’s dishonesty and bad faith, or if we want to be charitable, his ignorance of the basics. Either way, this one claim is sufficient to prove Friedman is no credible reporter or analyst. The Arab Spring was a grassroots chain reaction of rebellions against precisely the type of despotic regimes MBS represents. It was a series of large scale, interconnected popular revolutions-from-below that toppled or tried to topple MENA’s autocrats, not a top-down set of limited cultural “reforms” granted to his subjects by some dynastic absolute monarch. So not only is MBS no Arab Spring, but he is the exact opposite of it. Besides, it was the Saudi regime who in 2011 helped the authorities of Bahrain crush in blood its own Arab Spring. The KSA even sent military forces there to quell the demonstrations, and during the following years continued to police their neighbor. Though bin Salman was not in charge yet, no one heard him protest against that. Finally, the KSA under MBS remains firmly the main Arab ally of the ultra-violent Egyptian regime of President el-Sisi, himself one of the worst totalitarian dictators in the region, ruling with terror, fear and repression, and a proven mass murderer who in one single day killed nearly 1,000 of his own people when they were staging a sit-in protest against his July 3, 2013 military coup. As this Egyptian activist explains, the Sisi regime, a major MBS ally, is erasing in pure totalitarian Orwellian fashion every trace and memory of the Arab Spring to make sure it does not happen again. It is even claiming the 2011 protestors were traitors paid by foreign powers to sabotage the country. Tahrir Square, which was the heart and furnace of the Arab Spring, is now a military zone where demonstrations and gatherings are forbidden. Those are the kinds of policies MBS fully backs, both at home and abroad in countries like Egypt. 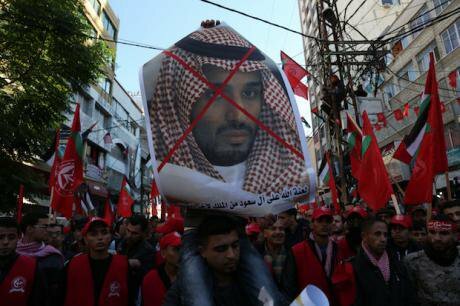 Bin Salman’s major allies such as Egypt and Bahrain systematically rank among those who repressed the Arab Spring the most violently and will not hesitate to do it again, with his full consent and support should the rebellions resume one day. Some commentators pointed out how outrageous it is for Friedman to take at face value MBS’ laughable explanations on how the Saudi justice system is investigating and prosecuting those alleged corruption cases in perfect independence. Friedman does not seem to realize that it is the KSA, where there is no such thing as checks and balances, let alone separation of powers or the independence of the justice system from government. Though another explanation is that he knows well, but chooses to pretend that MBS’ explanations are truthful. For a professional journalist, ignorance and naivety are sins that can nonetheless be forgiven, but bad faith and deliberate dishonesty to mislead one’s readership, furthermore in order to serve a tyrant, are far graver crimes, the kind that cannot and should not be forgiven. And Friedman’s bad faith in that piece is constant from beginning to end. Unless Friedman deliberately forgot, it has escaped his attention that the man he praises as some “liberal”, wise, visionary and generous “reformer” is the ruler of an absolute monarchy who furthermore, in blatant rupture with Saudi’s tradition of horizontal power-sharing within the royal family, seeks to establish a totalitarian one-man-rule. He has concentrated all powers—political, economic, cultural, religious, and military—in his own hands to an unprecedented level even by Saudi absolute monarchy’s standards, which is precisely what the Arab Spring revolted against. This “liberal reformer” is one who mercilessly suppresses dissent, eradicates any form of opposition (even potential) through a wave of purges, silences critics, and cracks down on human rights activists, judges, intellectuals, clerics, academics, and writers—under the usual alibi of “national security” that every autocrat and tyrant out there now conveniently uses. Even insufficiently enthusiastic shows of support are not tolerated. Friedman describes as “liberal” and “open” a despot who has actually eliminated whatever was left of freedom of expression in the KSA while allegedly having his security forces beat up and torture businessmen and investors (including fragile old men in their 60s) to make them reveal the details of their accounts so he can confiscate their assets. In a nutshell, “Mohammad bin Salman” next to “Arab Spring” is either an oxymoron or an antithesis. Behind his civil, mild-mannered exteriors and charming smile, Mohammad bin Salman is by far the worst, most extremist totalitarian despot in the history of Saudi Arabia. Nonetheless, he has been praised lavishly in western media for his projects of cultural reforms such as allowing women to drive (starting in June 2018, it is not even done yet) and attend games in sports stadiums, authorizing some concerts once in a while, or opening some more movie theaters, “one day”. Though such novelties are presented as major cultural revolutions—by Saudi standards—and are certainly welcome by the bored Saudi youth, they are hardly as groundbreaking or revolutionary as we are invited to believe. Take the whole hype about movie theaters: there is already one IMAX theater in Saudi Arabia, video rental stores appeared there as early as the 1980s, and Saudis have been watching movies of all sorts for ages on satellite TV channels, the internet, smartphones and DVDs. Besides, it will be interesting to see what kind of films are allowed in those new movie theaters. The authorized selection, which will no doubt be in the hands of some state censorship committee, will probably look bleak to a true cinephile! Friedman doesn’t even see the irony of praising “men-only concerts” and “women-only classical opera” as major revolutions! "Saudi Arabia would have a very long way to go before it approached anything like western standards for free speech and women’s rights." Or to save time, one could simply have asked one rhetorical question: will our oh-so-liberal Islamic reformist and enlightened sovereign, who allegedly desires to “open” the Saudi society and put an end to “radical Islam”, allow freedom of religions to exist in his kingdom? Or short of that, will he at least allow the mere existence of an opposition? Though, for that last question, we got the answer through his repeated purges and waves of repression. will he allow demonstrations to take place? Or will he allow the public practice of freedom of religion, the absence of which his own ally, the U.S. State Department has strongly criticised? Those are certainly not the kind of questions we can imagine Friedman asking his Saudi host. We all know the answers, and that too puts in perspective MBS’ alleged Islamic “moderation” and liberalism, whose limits are reached quickly and which boil down to allowing some more fun and entertainment in order to pacify the Saudi youth or keep it quiet. Friedman’s vision of women emancipation is equally laughable and as typically western and chauvinistic as the rest, not to mention how easily and obviously manipulated (with his full consent) he is by MBS and his entourage, who must have had a good laugh at their NY Times guest after his visit. "Then one of his ministers got out his cellphone and shared with me pictures and YouTube videos of Saudi Arabia in the 1950s — women without heads covered, wearing skirts and walking with men in public, as well as concerts and cinemas. It was still a traditional and modest place, but not one where fun had been outlawed, which is what happened after 1979." Besides the poor writing (“women without heads covered”? ), Friedman, who claims to have been traveling there “for 30 years” and presents himself as some Middle East expert, was apparently not even aware of those facts. He had to wait until 2017 to discover, all amazed at that revelation, what anyone a tad knowledgeable about Saudi Arabia had always known. "Alas, who Saudi Arabia is also includes a large cohort of older, more rural, more traditional Saudis, and pulling them into the 21st century will be a challenge." Oh, those old backward retarded peasants who may ruin our party and most likely do not even "talk the language of high tech" like all those wonderfully "young" people around him at MBS’ court... If only they could just drop dead or evaporate in the air! In passages such as those, Friedman reveals that far from being this hypermodern, future-oriented, visionary Alvin Toffler type he tries to be and who will explain to us the present and future shocks, he is actually a crude reincarnation of the west’s archaic civilizing mission towards the “inferior Arabs”: gotta’ educate those backwards folks and do so in alliance with their local despots, while “liberating their oppressed women” too by helping them show some hair and ankles, like ours, free women, proudly do! But the real ignorant here is Friedman himself, not those rural populations he so obviously despises without even knowing them. Friedman’s trips and interests in foreign populations are usually limited to a few encounters with members of the economic and political elite, plus chatting informally and randomly with “personal friends” who think like him or some cab drivers, then presenting this as if it were worthwhile sociological analysis. But to come back to our real power that be, MBS’ cultural reforms, refreshing as they may be to a young population who needs to breathe better in that society, are hardly anything more than classic pacification at a moment when some of the Saudi youth has become a bit restless about austerity measures, lack of jobs and uncertain future or aspires to the western-style instant gratification hedonistic fun they see in the media and experience during their travels abroad. Even the future driving permit for women was announced the same day as the arrest of 11 princes and hundreds of Saudi businessmen, in a clear attempt to divert the attention from this latest crackdown (and from the confiscation of the fortunes of those arrested without any hint of where exactly, in whose pockets those billions are going). But here is another development Friedman did not mention, whether due to sloppiness or ignorance: France’s top daily Le Monde reported that the very same day His Highness announced he would be lifting the driving ban, each of the initial group of 15 courageous women drivers/activists who challenged the ban were summoned one by one by the Saudi authorities and were ordered to no longer talk to the media without the prior approval of His Highness. This took place in the night of September 26-27, a few hours after the announcement that the ban would be lifted. Before that, the announcements on the forthcoming lifting of the driving ban coincided with crackdowns, arrests, and kidnappings of human rights defenders, in a clear, cynical attempt to create smokescreens and diversion. 3 of those 15 women testified to Le Monde, on condition of anonymity since they too are being closely monitored now. They specified that the order not to talk was "serious" and was communicated to them in a "threatening manner and tone". Most of them have now stopped tweeting and refuse to talk to the media. Even those who accept only do so reluctantly, insisting on absolute anonymity. One of them, Tamador Al-Yami, tweeted on her personal account: "For reasons beyond my control, I can no longer continue to comment on the lifting of the ban." On the other hand, the government is summoning those other women who support MBS (for example those appointed to his councils) to talk to the media and praise him for having granted this right to women. The activists who were interviewed explained that the reason for censoring their free speech and banning them from the media was to allow MBS to take all the credit for the measure, to be perceived as the one who initiated it and as a benign "liberal reformist" or “good king”, and above all (they all concurred on this) to avoid spreading the notion that grassroots activism like theirs could indeed force the Saudi regime to grant such measures: "They are afraid that if people see our campaign has been successful, it will open more doors and people will realize public pressure can indeed bring about change", they say. That about puts this whole “liberal reform” and driving permit thing into perspective. But don’t expect to find any of it in a Friedman’s column. As those women said, he indeed gives all the credit of that future measure exclusively to MBS without mentioning even once the major role played by those courageous activists, who, as Madawi Al-Rasheed writes, “will probably also be allowed to drive themselves to jail if they criticize Mohammed ben Salman”.